Following New York Fashion Week’s edit now it is time for London to show us what it has got! Here are London Fashion Week’s best looks according to yours truly. Renowned for outlandish and at times frightened collections, Giles Deacon did not disappoint. 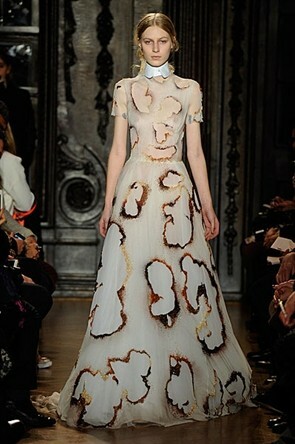 Every girl’s fashion nightmare has to be burn holes, rips and cuts in their gowns yet designer Giles managed to turn this into beautiful burn patterns and intricate cuts in his Fall RTW 2012 collection. 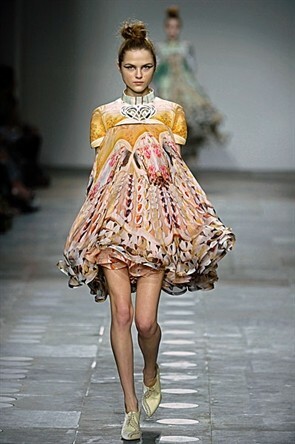 Mary Katrantzou pulled her full skirts from the waist up to the chest and I love it. 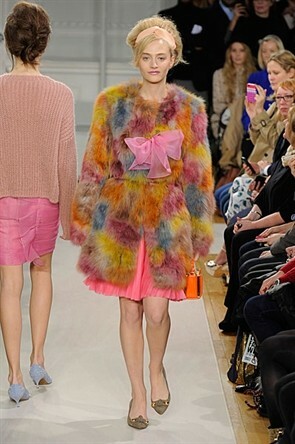 The spring trend for pastel shades is set to continue into Autumn if Moschino has anything to do with it! Their Cheap & Chic collection seemed to have been attacked by toddlers armed with crayons and paint. As I reported on New York Fashion Week Russia is set to be a big influence on Autumn/Winter 2012 trends. Temperley London added cossack hats to gold embroidered evening wear.